My uncle and aunt’s home is a very old stone house in the countryside of Ontario. In the doorway between the kitchen and sun porch is a stone threshhold that has a deep impression worn into it, evidence of thousands of footsteps passing through over the course of more than one hundred years. 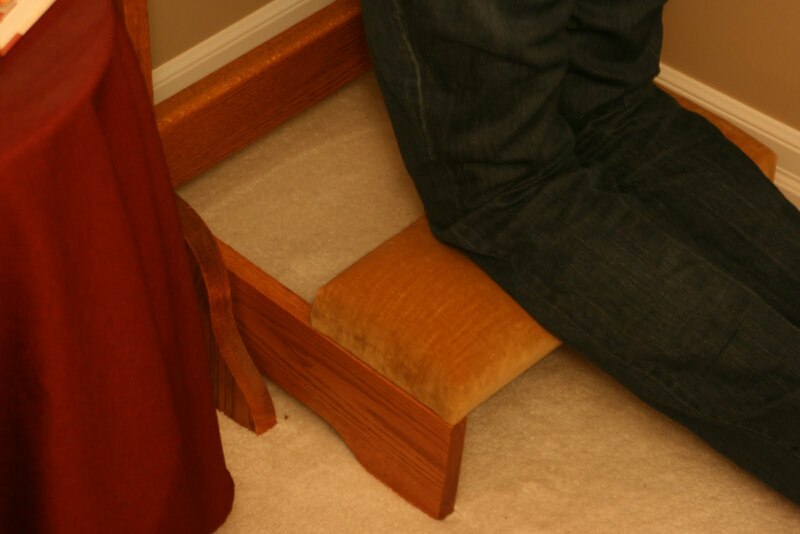 My daughter’s wish reminded me of one of my own: I always wished that our prayer kneeler would be worn and indented as evidence of thousands of prayers lifted to heaven over the course of a family’s lifetime. When we purchased this prayer kneeler a half-dozen years or so ago, I remember silently making this wish, the image of the old stone threshhold dancing at the forefront of my mind. Some wishes, like my daughter’s, are so easily fulfilled that we regret that they were not spoken sooner. Some wishes are only fulfilled on one’s knees at the cross of Christ, by the miraculous power of our Lord Almighty, in answer to our prayerful cries. Some wishes, like mine, are not fulfilled in our prayers; rather, they are fulfilled through our prayers, through the act of praying. Yes, it will take a lifetime of prayers to fulfill my wish, both physically and spiritually. One day at a time. Until the Lord takes me home. Do you have an “I always wished that…”? What will it take to fulfill your wish? I love this post and your heart's desires.